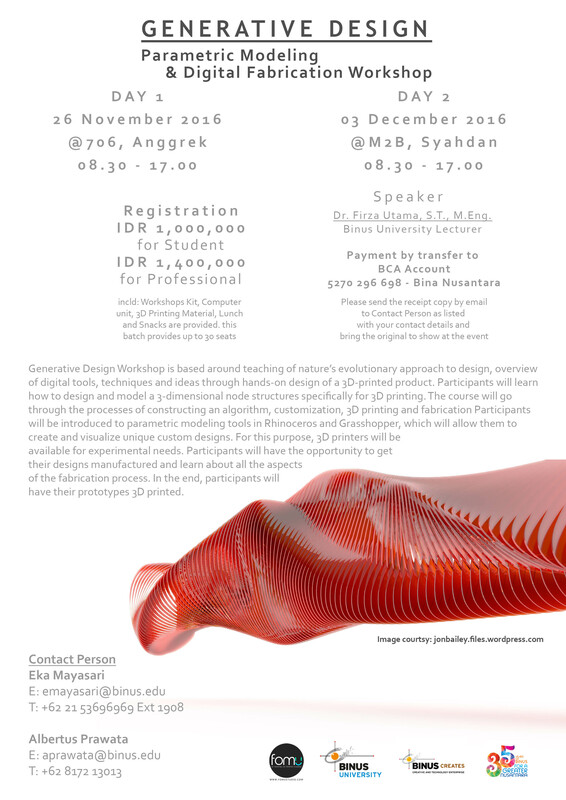 Generative Design Workshop is based around teaching of nature’s evolutionary approach to design, overview of digital tools, techniques and ideas through hands-on design of a 3D-printed product. Participants will learn how to design and model a 3-dimensional node structures specifically for 3D printing. The course will go through the processes of constructing an algorithm, customization, 3D printing and fabrication. Participants will be introduced to parametric modeling tools in Rhinoceros and Grasshopper, which will allow them to create and visualize unique custom designs. For this purpose, 3D printers will be available for experimental needs. Participants will have the opportunity to get their designs manufactured and learn about all the aspects of the fabrication process. In the end, participants will have their prototypes 3D printed. *Include: Workshop kits, Computer unit during workshop, 3D printing material, Lunch and snacks. Payment transfer to BCA Account Bina Nusantara 5270 296 698 (Please send the receipt copy by email to contact person listed with your contact details and bring the original to show at the event).